[Natural Care] 내추럴 케어링스탑, 180 캡슐Ring Stop, 180 caps이명증상 있으신분들께 추천! ※ 본 제품은 제조사의 사정으로 유통기한이 별도 표기되지 않는 제품입니다. 제조사에서 가장 최근 제조일로 입고되어 발송되는 제품으로 1년이상의 유통기한이 보장되는 제품입니다. 처음 30-90일 동안은 하루 3 캡슐씩 복용하십시오. 이후부터는 복용량을 하루 2회 1캡슐로 줄여주십시오. 최고의 효과를 위해 3-6개월간 사용해주세요. 현재 쿠마딘이나 와파린과 같은 혈액 희석제를 복용 중이거나 임신 중이거나 수유 중인 경우, 이 제품을 사용하기 전에 건강 전문가의 조언을 구하십시오. 적절한 시간이 지난 후에도 증상이 지속되거나 악화되는 경우, 의사와 상담하십시오. 과다 복용한 경우에는 즉시 의료 도움을 받거나 중독관리센터에 연락하십시오. 소비자 보호와 제품의 신선도를 위해 이중 안전 밀봉되었습니다. 귀 울림/이명 증상과 소리에 민감한 가벼운 증상을 일시적으로 완화하는데 도움을 줍니다. Do not use if safety seal is broken or missing. Do not take more than the recommended dosage. If you are presently taking agents for blood-thinning, such as Coumadin or warfarin, or if you are pregnant or nursing, seek the advice of a health professional before using this product. If symptoms continue to persist after a reasonable period of time, or if symptoms get worse, consult your doctor. In case of overdose, get medical help or contact a Poision Contol Center right away. Indications: This product and *guide together are designed and formulated to help temporarily relieve minor symptoms of ringing and/or buzzing in the ears, and sensitivity to noise. 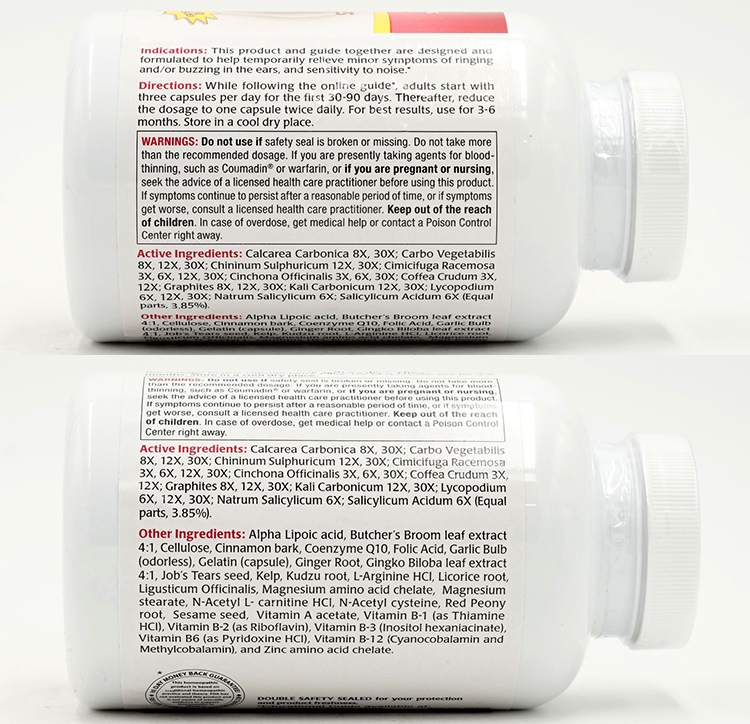 Directions: While following the online *guide, adults start with three capsules per day for the first 30-90 days. Thereafter, reduce the dosage to one capsule twice daily. For best results, use for 3-6 months. Store in a cool dry place. Other Ingredients: Alpha lipoic acid, black sesame (hei zhi ma), butcher's broom leaf, capsule (gelatin, glycerin, and titanium dioxide), cinnamon (gui zhi), CoQ10, folic acid, garlic bulb (odor-controlled), Ginger root, Ginkgo biloba leaf extract, Job's Tears seeds (Yi Yi Ren), Kelp, kudzu root (ge gen), L-Arginine HCl, Licorice root, ligusticum root (chuan xiong), magnesium amino acid chelate, magnesium stearate, methylcobalamin, N-Acetyl carnitine HCl, N-Acetyl cysteine, peony root (Chi Shao), Vinpocetine, Vitamin A acetate, Vitamin B-1 (Thiamine HCl), Vitamin B-2 (Riboflavin), Vitamin B-3 (Inositol Hexcaniacinate), Vitamin B-6 (Pyridoxine HCl), Vitamin B-12 (Cyanocobalamin), and Zinc amino acid chelate. 가격 몇달 사이에 두번쨰 구매했는데요.